Biochar / Charcoal in the earth wall remaining since more than hundred years. There are many advantages of using the Biochar as a component in Green Buildings for clean indoor air. Biochar can remain for up to 1000 years and more in the soils. Biochar found in earth walls of over 100 years old, is still intact. 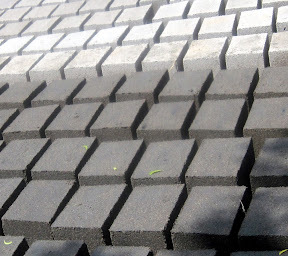 Biochar can be mixed in different proportions with sand / cement / earth / other suitable material to produce bricks / panels / blocks. The percentage Biochar in different products can be decided based on the purpose and product properties. Biochar use makes the building walls light and insulate. The Biochar produced from different biomasses, temperatures and processes have different properties. Some types of Biochar properties are Coconut shell Biochar appears crystalline, Bamboo Biochar having traditional values, rice-husk Biochar having high silica, etc. The highly porous surfaces of biochars have been shown to adsorb N2O, CO2 and CH4 (Lukas Van Zwieten et al). The Biochar when used in green buildings absorb some of these green house gasses. The Biochar in the debris when used in green buildings, after reaching landfill sites reduce the GHGs emissions from landfill sites and prevent leachets. Biochar can be used as screen for purification of air entering into buildings. Biochar regulates humidity indoors, the emissions from indoor toilets are absorbed. The Biochar urinals reduce NOx emissions as well tap urea from urine for later use as soil amendment. It can be applied to the soil for indoor plants / gardens, as air purifier in refrigerator, for water filtration in aquariums, etc., for reducing emissions from various sources. Considering the life, source and property of Biochar, it is a means for carbon sequestration. It also brings other benefits; temperature is regulated through insulation, as a light weight material suitable for high raise buildings and reduces cost of construction. Biochar is resistant and repels termites and ants. Biochar is the source of negative ions, prevents oxidization, emit far infrared radiation, and dissipate electromagnetic fields from many electronic and electrical devices in a house, these characteristics improve the living conditions in a house. Considering the properties of Biochar for improving the indoor air quality and benefits to the user and environment, can be used in all the green buildings as per the need. Biochar / charcoal has many good properties. Bricks are made using, rice husk biochar (a byproduct from rice mills), cement and sand. With different proportions the bricks are made. - Even when the building is demolished, the biochar would benefit the soil. Note: The rice husk biochar is saturated with water.